These Scalloped Sweet Potatoes are so creamy and delicious. 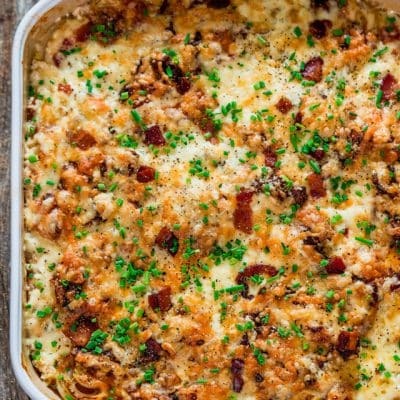 Loaded with bacon, four types of cheese, and perfectly spiced, they’re the ultimate side dish for your holiday or winter meals! 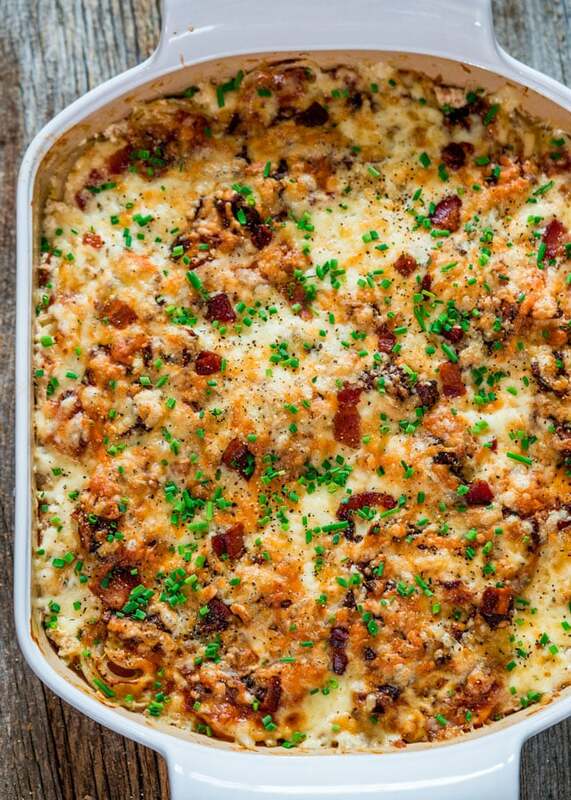 The delicious cheese and bacon aroma that will take over your kitchen as you bake these scalloped sweet potatoes will surely drive you crazy. I know, because that’s what happened to me. But besides the crazy good aroma, these sweet potatoes are incredible, not to mention they are the perfect side dish for your Thanksgiving dinner table. They are also pretty easy to make, all you really need to do is layer the ingredients and bake. This is a huge casserole that will generously feed 12 people. I used about 2 lbs of sweet potatoes, but use more or less as needed, it also depends on the size of your casserole dish. There are also a lot of onions here, but come to think of it, leeks would be perfect here in place of onions. 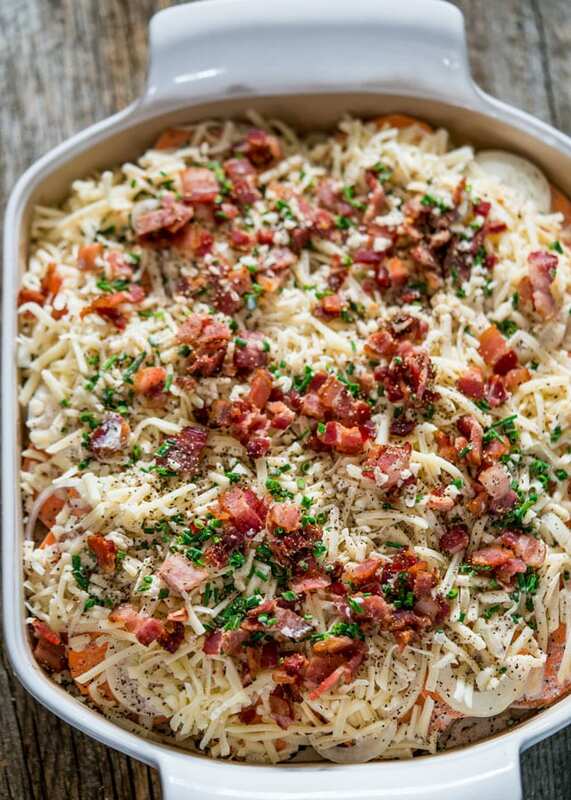 My favorite part about these scalloped potatoes, however, is all the cheese and bacon. I’ve told you many times before that bacon makes the world go round, but bacon and cheese together, well can you think of anything better? As far as the cheese goes, I used an assortment of cheeses. I actually found an Italian mix of cheeses, already shredded that includes all the cheeses mentioned in the recipe, but if you can’t find it, I listed them all there. Of course you don’t have to use those exact cheeses, you can use whatever you prefer, maybe just mozzarella, or maybe mix mozzarella with some gruyere, whatever you prefer. 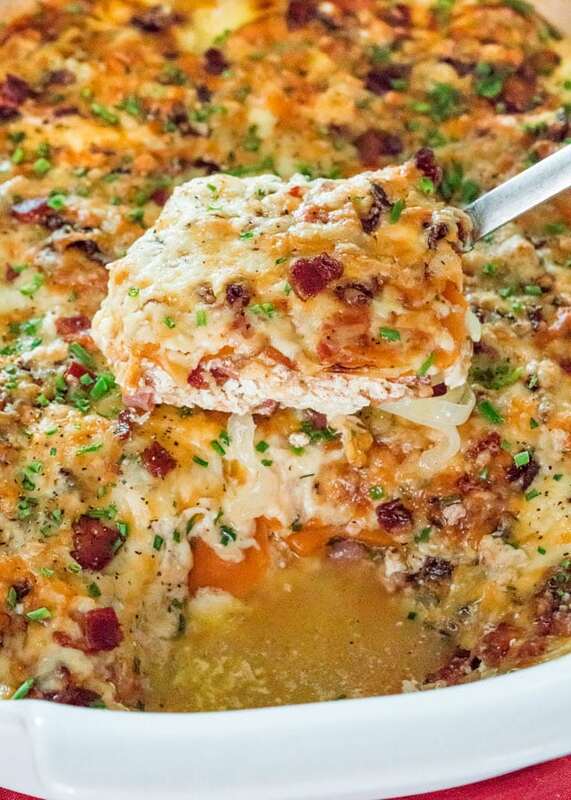 After you bake this casserole, you’ll get a really nice crust on top made up of cheese and bacon, have to say that’s my favorite and I could just eat the crust, if you know what I mean. When you first take the casserole out you’ll notice that there might be quite a bit of liquid in the dish, but let the casserole rest for 10 to 20 minutes, and the sweet potatoes will soak up all that liquid and all that’s left to do is eat! These Scalloped Sweet Potatoes are so creamy and delicious. They're the perfect side dish for your holiday or winter meals! In a large bowl, add the half and half, pumpkin pie spice, paprika, nutmeg, red pepper flakes, salt/pepper, chives, garlic and whisk well. Set aside. In another large bowl toss all the cheeses together. In a large casserole dish (I used a 12" x 10 1/2" x 2 1/4" casserole dish), start layering ingredients, we'll have 2 layers of each. Layer half of the sweet potatoes on the the bottom of the casserole dish, followed by half of the onion slices, half of the cheese spread evenly, half of the bacon, then ladle half of the half and half mixture over the casserole. Repeat layers with remaining ingredients. Bake for 1 hour and 15 minutes or until the sweet potatoes are fork tender. There will be some liquid in the casserole but as the casserole cools a bit, the potatoes will soak up all the liquid. * Half and half is equal parts of whole milk and light cream and usually has a 10 to 12% fat content. Store leftovers in an air tight container in the refrigerator for up to 5 days. 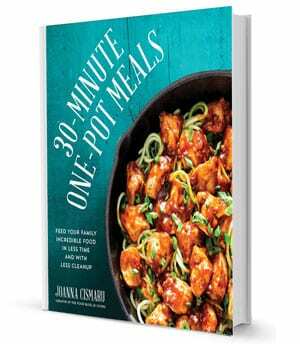 This recipe will work for sweet potatoes or yams- whichever you prefer/ are available to you. I thought that it was a little sweet for me. I think that It might have been better if the cinnamon was left out, or maybe if there were some bread crumbs or regular potatoes in it instead. I am definitely making this dish….have already gathered the ingredients.but need one clarification after watching the video this evening. The video is shown using yams, rather than sweet potatoes. I try to adhere to the recipe when first making, so would like to be on track as to which one you are suggesting for best results. I did a taste test with my “cooking” student a few months ago to compare the flavor between the 2 and there is a definite distinction between the 2, especially in sweetness . Waiting for a yummy response, Maggie. Sweet potatoes would be best. We had some trouble finding them and used the yams instead. Using yams just mean you may need to add a bit more time as they are more dense that sweet potatoes. 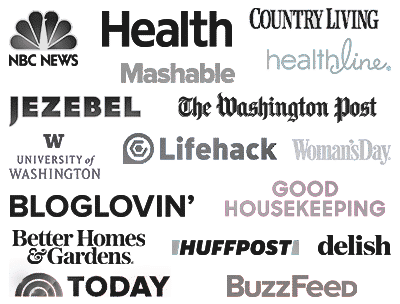 You will love this recipe….it’s a favorite…. Oh, how “sweet” with your QUICK response. I had already purchased sweet potatoes before writing my question, so I am very pleased to not have to buy more ingredients. I love sweet potatoes but I have never had them in this form, they look mouthwatering! I think I could even convince my kids to eat sweet potatoes with this casserole. what a wonderful recipe! I much prefer sweet potatoes to their more popular cousins, so love this tweak to the scallop-potato recipe, thank you for sharing this perfect twist! We love this recipe and hope you try it and do let us know how you like it. Thanks for commenting and being a part of Jo Cooks, we appreciate it and you!!! This is killing me! I just made the exact thing (actually second version) today. It’s cooling on the counter as I type! My spices are different, but this is crazy….